A group of divers have discovered an undersea river, complete with trees and leaves flowing on the sea bed. Besides this single undersea river, other instances of river under water have been discovered by scientists all over the world. 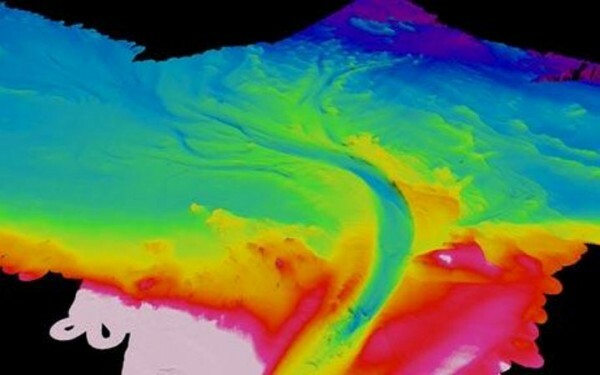 These findings have made scientists all over the world to consider the possibility of existence of more such rivers under sea and on ocean beds. What was earlier considered as a miracle or maybe an instance of paranormal activity has now scientific explanations to make this process clearer. This makes one thing certain rivers under the sea can exist scientifically. This undersea river has been discovered in Mexico, under the sea of Mexico. 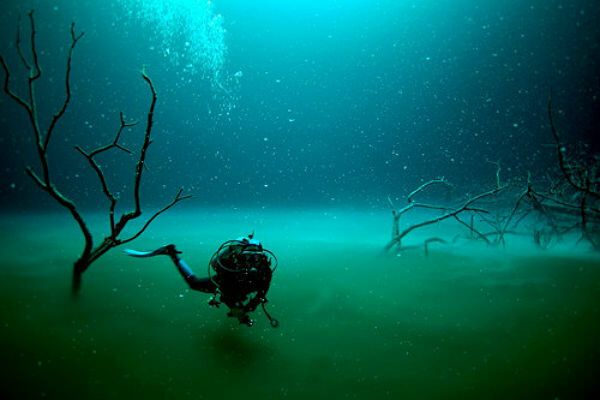 It’s been given name of ‘Cenote Angelita’ but is more famously known as river in the sea. 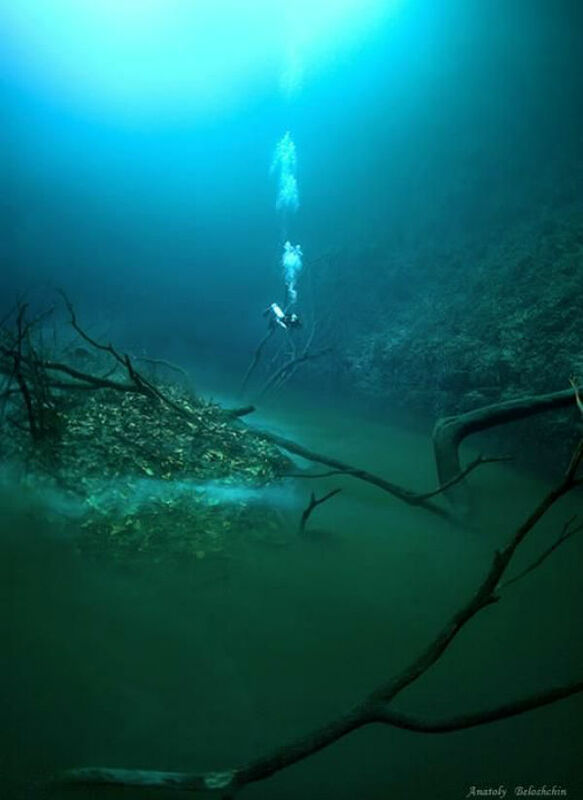 According to Anatoly Beloshchin and his group of divers who were first ones to discover this phenomenon, this river under water is a complete river like any conventional one. It flows as much as 115 feet deep at some places, with flow of both fresh water and salty water at varying depths. Another undersea river is believed to be actually a bed of thick layer of hydrogen sulfide gas which is produced by bacteria of sea bed upon decomposition of organic matter. This is nothing like a real river in many terms as this is just a thick layer of foul-smelling gas that curves and bends its path like a river would. However, the illusion it creates is of a river, even with river banks and foliage. This is enough to classify it as an undersea river, in opinion of many scientists. Another case of river under sea was discovered by team of Dr. Dan Parson of University of Leeds at bottom of Black Sea. This undersea river is considered to be flowing with enough flow to count it as sixth largest rivers of the world when compared to its counterparts on the land. Believed to be more than hundred feet deep at certain places, this river can flow with a rate of 4 mph and about 22,000 cubic meters of water passing through this particular channel. The river in sea discovered by Dr. Parson and his team is believed to have been formed as a result of this phenomenon. Stemming from the salty water of Mediterranean Sea into the Black sea through the Bosphorus Strait, this undersea river carves a channel of its own which can run as much as 0.6 miles wide. The sediments carried by this flow make a river bed forming a separate structure. Ever since news of such rivers under sea were public, scientists all over the world have been looking for more such examples. Many have been found and even more will probably be discovered. The reason for formation of such rivers can be various. Sometimes it stems from the bigger part of the sea underneath, and flows and carries a lot of sediments, which over the time convert it into a complete river like body of its own. You can watch short movies made by divers at Cenote Angelita here and here! in response to Janet, for your information all the branches of Science are found in Quran, all what you see and to be seen are also there in The Glorious Book. Spirituality is the next level of science. I'm not Islamic, so this is just what I've been told, so don't get mad if this is wrong. Watchers are a lot like guardian angels. They watch over people of the Islamic religion. In the Qu ran, it talks about how Allah wants peace. He is judging people if they are good or bad as God does in the Christian bible. It is not a river under water. It is Hydrogensulphur gase. As the gase is not soluable itself, it flows under water. It is not a new discovery either. look at the damn video.. its not bitter while the other part is bitter, "LIKE THERE'S SOME BARRIER"
the man who swim to do some test would be dead by now.. you ignorant. This isn't Islam or Christian religious crapola -- this is SCIENCE. Please note the difference. One is based on facts. The others are not. ACTUALLY if you were really scientific you would know that science has no facts. The "facts" are theories that change based on the discovery of more information. For instance, I'm sure you thought you knew all sorts of "facts" about a brontosaurus but in more recent years it's been discovered that it never actually existed. I don't think you know much about science OR religion if you think that something is more based on so-called "facts" than the something else. In the end most everything is speculation. Science consists of experimental observations which are explained by theories which are used to predict the outcome of further observations. If the prediction holds, the theory is considered successful, if it does not, then the theory must be modified to explain the observations and further tested by experiment and observation. Religious truth is derived from divine communication through prophets and/or divinely inspired writers. Religious truth is subject to cultural influence, although there are many shared values between religions. Science works the same for all religions and none. Science can help you develop nuclear power. Religion tells you the ethics of using it. In the Qur'an there are many scientific facts. Read the Qur'an! Do not talk in advance! yes....but if you read the verses before and after 6:7 "vault" means sky and how God gave form to the earth. In those verses it is described how God separates water. The separation is called "sky" (this will be relevant later, that's why I made it bold). It also says there is water both under the sky (on Earth) and also above the sky (in space?). "Gardens beneath which Rivers flow" is a line from The Holy Quran. Muslims have known about this for Centuries. nothing about that book can be called 'holy' and the ramblings of fools will occasionally be correct as even a broken clock is on time twice a day. An occasional utterance of a fool may be correct.BUT when all the words and predictions of some one have proved correc (eg.the Source of Quranic Verses) and you still call him a fool, you are quite wrong. john, your foolish reply shows you to be merely ignorant, do you realize that the Quaran, most of it, is exactly the same as The Bible, the Old Testament in them is almost exactly the same, they come from the same Biblical Families as the Jews and Christians. Only the later books are written by those who followed Mohammad, or Christ or WHOEVER, was written by those in power in order to keep power. The wars between any sort of religion only serves to strengthen power bonds of the church, the rich and the kings and enrich the Banks, and Always Have. Before you go and cast your ignorance upon the Public Waters, go and do at least a Little Research First, eh? The Quaran is mostly exactly the same as the bible, and therefore.. Wait, what were you trying to say? ignorant among the people would allege that the second one did just copy the first.